Last Saturday, September 1st, Letovo School in Moscow was officially opened and greatly celebrated. The campus was designed in cooperation with atelier PRO architects. The landscape design has been created by Buro Sant en Co landscaparchitecture. Letovo School in Moscow is a unique school in Russia. It is a school established for highly motivated and gifted children aged 12 to 17 from all over Russia, regardless their financial situation. High end educational facilities have been selected to give the best possible education. The school campus school is located southwest of Moscow in the newly developed Novaya Moskva district. Buro Sant en Co is very proud of this Russian campus project, as one our international design assignments. The outdoor space and the landscape will become even more fascinating in due course when trees and plants wil grow. 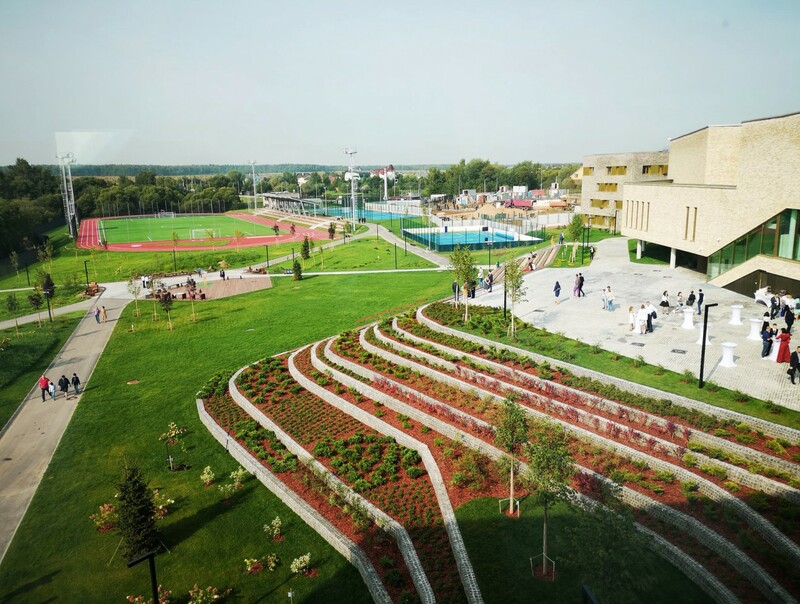 The landscape that also accomodates sports facilities adds great value to the learning and living experience of the students and school staff.